I have a confession to make: I don’t wear socks….ever. Even in the winter time, I’ll be barefoot in my boots. I’ll be the first to admit that it’s not the smartest thing to do for a few reasons and I know I’m not setting a good example for my two kids. They both wear their socks. I don’t even remember how or why I stopped wearing them. In the winter, sometimes I’ll put a pair on and try and wear them for a day. The next day, it will be no socks as per the norm. There is a downside to not wearing socks. Yes, it can be cold at times, but my poor feet are in need of some major TLC. My feet are TOUGH. They are callused and dry and I’m even nervous sharing this secret of mine with you today. I know I need to take better care of them. I’ve tried foot files and pumice stones in the past, but found them too tedious to use so I gave up. 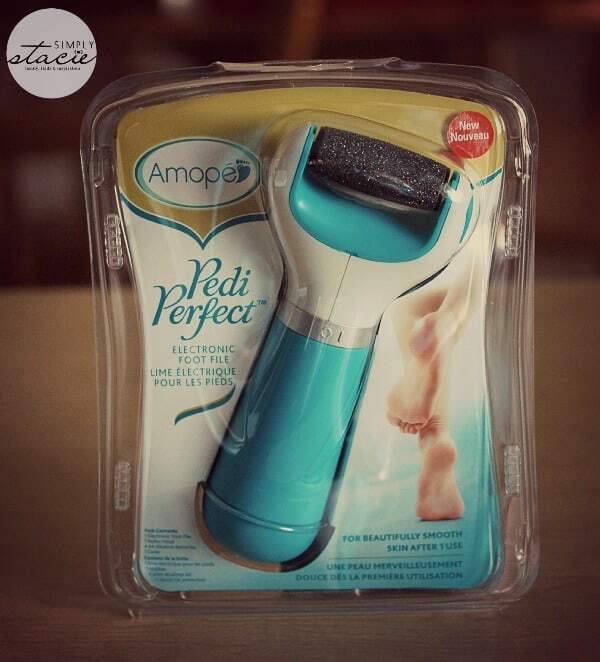 I need something easy that takes little effort to use and I’ve found a solution: the Amopé™ Pedi Perfect Electronic Foot File! 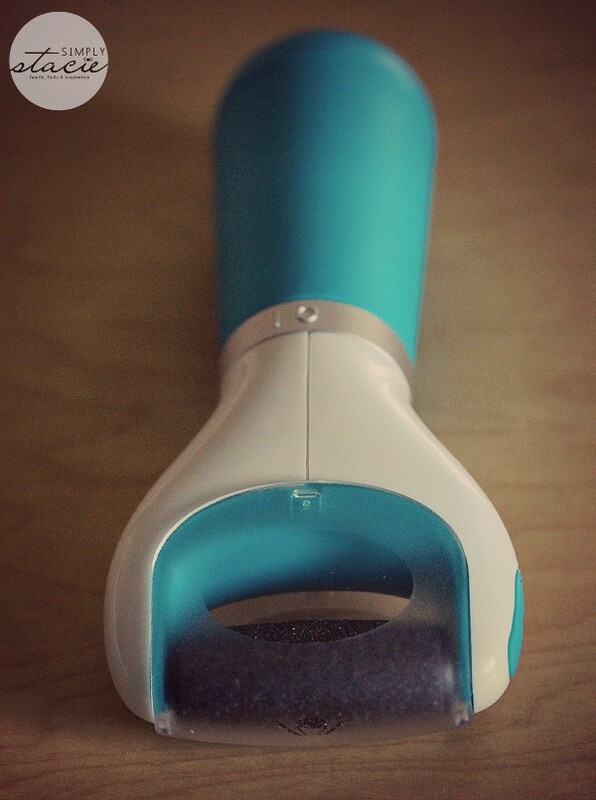 This electronic foot file and callus remover will remove dead skin and make your feet smoother and softer in just one use. It has a Micralumina roller head which is like an electronic pumice stone that quickly and painlessly buffs and exfoliates. It’s cordless and takes four AA batteries and is ready to use out of the package – no charging required! My sister goes to a spa where they shave the calluses off her feet which sounds scary and a bit gross! I like that the Amopé™ Pedi Perfect Electronic Foot File has no sharp blades so I can’t cut myself. I noticed a remarkable difference the first time I used it. Your feet must be dry to use it so don’t soak them ahead of time. Also, make sure you do it in the bathroom because they’ll be fine particles of dead skin coming off. It will make a mess so it’s better it’s near the tub so you can easily clean it up. To operate, just turn it on and move it over the dry, callused areas on your feet with medium to light pressure. If you push too hard, it has a safety feature to stop on its own. I couldn’t believe how much it took off. Like I said, my feet were pretty bad and they look 100 times better now. When I’m done using it, I rinse my feet off with warm water to get rid of any dust and then moisturize. My feet are looking better and feeling softer with every treatment I do. They are starting to look like normal feet again! I was worried at first that it might hurt. It doesn’t at all. It’s not even uncomfortable except when I started to giggle when I move over a few ticklish spots. My feet are extremely ticklish. I found them on Amazon.ca (currently a best seller & qualifies for free shipping), Well.ca, Shoppers Drug Mart and Amazon.com. You can also pick one up at Loblaws grocery stores, Jean Coutu in QC and Uniprix in QC. I’m telling my sister who is obssessed with pedicures that she needs one of these products! Maybe I’ll surprise her with one for Christmas instead…. Looks like a fantastic product, I need to put this on my wish-list, wearing no socks all summer and now the dry air of winter has my feet looking horrible! I need to get one of these for my hubby, his feet are terrible! I don’t know how you can go without socks in the winter, my feet would freeze! Looks like a product for me. My feet are terribly dry all the time. I use Vaseline sometimes to help soften the skin, but I really need something like this. Putting this on my wishlist. This is the #1 thing on my wish list.I have seen it advertised on TV and am hoping it comes to Walmart.My feet get seriously cracked and dry in the winter.I need this.Thanks for the great review. I just got mine for Christmas. My husband got it from WalMart, and he found it in their “As Seen on TV” section. We paid $35 for it, and even though I think that is a little high, I think that it is worth it. I used it last night for the first time and it is AMAZING! I go barefoot a lot when I am at home and to be honest, I have NEVER had a professionally done pedi. Also, the last time I did a full blown pedi at home was over 5 yrs. ago (and it took me ALL DAY LONG to do it right), so you can see that I was dealing with years of built up, crusty skin and calluses. That is, until last night. The Amope is totally worth whatever amount you choose to spend on it. I used it in two 5 min. sessions per foot (20 min. total) and my feet are 100X better. 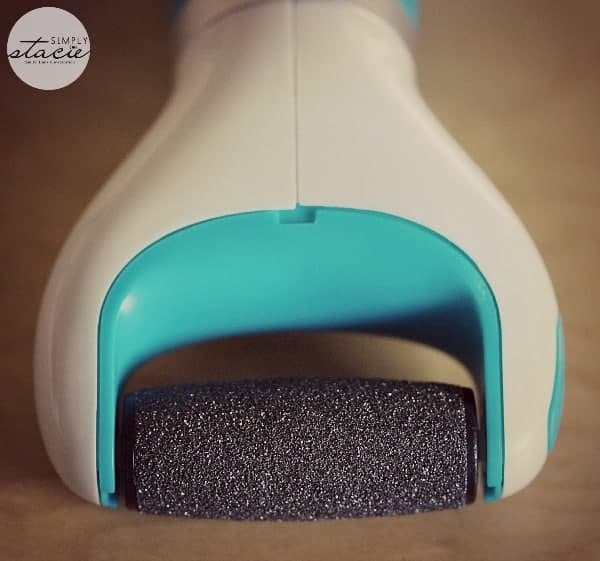 **Two things to keep in mind: This is not going to completely remove years of hardened skin in one use, but if you use it once a day, 5 min per foot, after one week you will have beautiful feet. Of course, I am basing this on my experience, and I have heavy callusing. If your feet aren’t as bad, you won’t need to use it as much. Second, if you use a circular motion while touching the roller to your skin (NOT pressing it into your skin) and remember to switch the angles up, you will have better results more quickly. I love love love it!!!!! I would love one of these, my feet are just horrible, it would be nice to have soft feet again!! I so need this in a bad way!!!! This will definitely go on my Christmas Wish List. I can really use this looks interesting, never seen one like this, makes sense! I love weird beauty stuff like this hah! I really want to try this now; I walk barefoot everywhere.. so my calluses are pretty bad! This is definitely on my gift list for someone special whose feet are really suffering. This is on my Christmas list for sure. My feet always need extra tlc in the winter. Yeah. Someone else who hates wearing socks! And shoes too. Why put on a pair just to run across the street for the mail. By the fall, mine are quite rough! I don’t find the files that great either. A couple of days later, feet are rough again. Thank you so much for trying this out. I wasn’t sure about getting one but now I definitely am. Sure you don’t want to give one away. Hint …. I also have dry and crack (flat) feet that needs tending to on a daily basis, especially in the wintertime. I have been looking for the right product for my feet to feel and look good. I’ll have to put this on my Christmas wish list. Available at Shopper’s!!!! Keeping an eye open for it….a couple folks I know would appreciate having one. This would be great after walking around barefoot in the summer and developing callouses. I hardly wear socks…just with boots or tennis shoes. Mostly I go without, too, and it can wear on your feet. I’ve used the cheap pedi exfoliators but like the look of this and it being electric I would think would be quicker and easier. Glad to know it didn’t hurt. I saw these in the store and wondered how they worked! Thanks for the review.